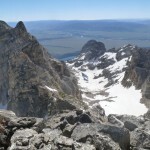 In addition to being a scenic and less-crowded hike, Hanging Canyon is ringed by a serrated ridge containing many lesser peaks and crags. 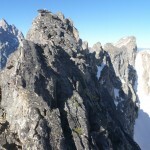 A full traverse passes over Mount St. John, Minga and Needle’s Eye Spires, Camel’s Head, the Jaw, Jaw Crags, Ayers Crags, Rock of Ages, Symmetry Crags, and Symmetry Spire. 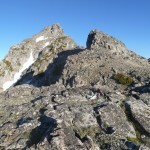 The route can be done in either direction, starting with the east ridge of either St. John or Symmetry Spire, with 5th class downclimbing (or rappels) required in both directions. 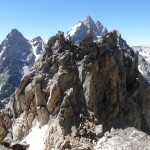 However, it may be slightly easier starting from Symmetry Spire. The best/hardest/most-interesting climbing is between St. John and Rock of Ages; the Symmetry Crags are mostly forgettable. 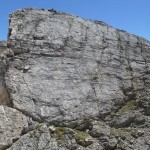 The rock quality is highly variable. It is usually good on the steeper sections, but one should climb cautiously and watch for sudden changes. 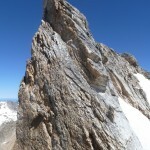 Being lazy and out of food, and having done it only a few days ago, I skipped Symmetry Spire at the end, but completed the whole traverse in 12h45. I found unrelenting 3rd to 5th class climbing (up to 5.4-5.5) along much of the route, making this a rewarding but demanding day. While I did not have to backtrack much, I found challenging route-finding, especially between Minga and Needle’s Eye Spires. Expecting a long, hot day, I started from String Lake at 4:30, easily finding the unmarked trail to Laurel Lake shortly after the trail turns north. Doing the traverse this way gets most of the day’s elevation gain out of the way immediately, so I spent a couple hours grinding up St. John’s east slope to the low point of its summit ridge. I bypassed most of the points on the way to the summit, then took a break to contemplate the serious climbing ahead. 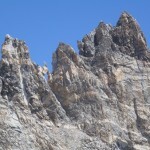 There are several spires on the ridge between St. John and Minga Spire, steeper on their west sides. 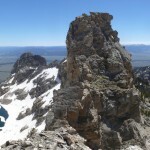 The best approach seemed to be to stay on the ridge to the top of each major pinnacle, peer over the precipitous sides, and decide which looked least scary. Sometimes a bypass to the left or right worked best, and sometimes climbing straight down the crest. This tricky downclimb section would have been easier in the other direction, but since the pinnacles on the Symmetry Spire side are also steeper on the west, you have tricky downclimbs in either direction. Ortenburger says that the west side of Minga Spire is 5.6 and/or requires a rappel, so I was not surprised to find serious difficulties when I reached it. After finding the north side impassable and the ridge unappealing, I made my way down a loose gully to the south. The gully steepened and eventually cliffed out but, looking around the west corner, I found a miraculous 5.4/5.5 traverse northwest across vertical, blocky black rock, which got me to the slope below. 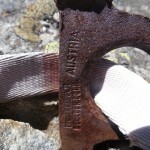 This was probably the crux of the route. I scrambled back to the notch west of Needles Eye Spire, then eventually found the right ramp around its north side (stay high). The climb from the east notch is steep and very exposed, circling slightly south, but remains 5.4 thanks to big flakes and positive holds. I found an old rap sling at the top, then carefully downclimbed and traversed back around, thankful to be done with the most difficult and least certain portion of the traverse. 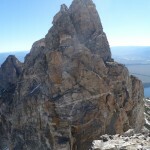 The route to the Jaw is straightforward by comparison, with one long but moderate downclimb to the south getting around Camel’s Head Spire. I’m pretty sure I tagged the top, since I was staying on the crest, but the distinctive Camel’s Head is not visible from the ridge itself. After a bit of route-finding trouble on the way down, I tagged Ayres Crag 3, then cruised the broad, slabby west face of Ayres Crag 2. Ayres Crag 1 is a bit more serious. I scrambled around to the top of the boulder at its base, then spent a bit of time figuring out the first few delicate moves on the flake that forms its lower face. Fortunately, the remainder of the climb is much easier than the bottom of the flake, with nicely spaced little ledges to grab or stand on. 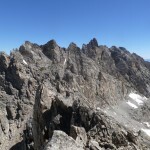 I retraced my steps rather than downclimbing the 5.6 east ridge, then dropped into the southwest couloir of Rock of Ages. My photos of the guidebook paid off here, as the southwest couloir forks; I descended the left fork, then turned the corner to head up the right fork, which is more of a face than a couloir. 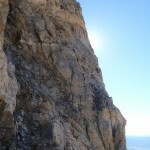 The route steepens as it wanders up and right, left along a ledge, then up a widening gully/face. After some experimentation, I found a way through the headwall to the west ridge (5.4), then up one more step on the ridge and along easy ground to the summit. 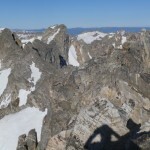 I inspected Symmetry Crags 4 and 5 from the summit, then dropped down the south couloir and contoured around to the notch west of Symmetry Crag 5. I was tired, there was snow, and misery ensued. 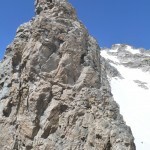 The north side of this notch consists of two steep couloirs, both partly filled with hard-ish snow. 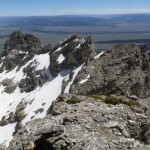 I downclimbed the side of one as far as I could, then got out my axe to hack and scrabble my way down and east across the snowfield to a grassy ledge north of the crags. The snow was too steep and (under the surface slush) hard to boot-ski or glissade. 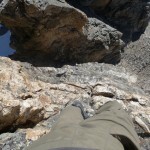 With some difficulty, I was able to kick steps back up the side of Symmetry Crag 5 to its summit. Dropping down the east ridge, I managed to bypass much of the steep snow and plunge-step along the west face of Symmetry Crag 4. 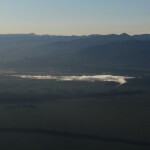 Driven by fatigue, I saved myself perhaps 50 vertical feet by climbing a low 5th class chimney to its north face, then a class 3-4 scramble to the summit. Then it was a blessedly easy and snow-free descent along the east ridge and around the south side of Crag 3 on a semi-treed slope and ledge. With victory, or at least Symmetry Col, in sight, I tagged Symmetry Spires 3 and 2 (the higher of two bumps between Spires 3 and 1). Symmetry Spire 1 is a short 3rd class jaunt from the col, but I managed to save myself some distance with a class 4-5.easy line up the northwest side from the saddle. I probably should have tagged Symmetry Spire itself, but I was tired, and had recently climbed its southwest ridge, so the short 4th class scramble to its summit interested me not at all. 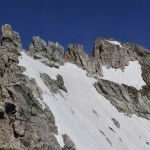 I carefully picked my way down the north Symmetry couloir, slid down to Lake of the Crags for more water, and found pleasant boot-skiing much of the way down Hanging Canyon. Back on the trail, I finally put myself on autopilot and, after enough downhill recovery, was able to jog the smoother stretches. 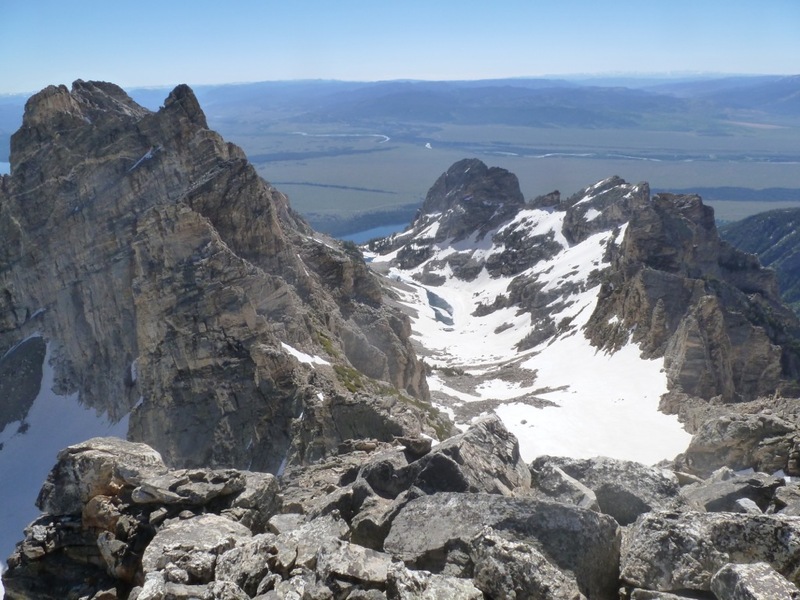 I mostly jogged past the tourist hordes on the Jenny Lake trail, and reached the car feeling tired but much stronger than on the last section of the ridge. It was a short day compared to some things I have planned, but the relentless scrambling was incredibly taxing. This entry was posted in Type II fun, Wyoming. Bookmark the permalink.